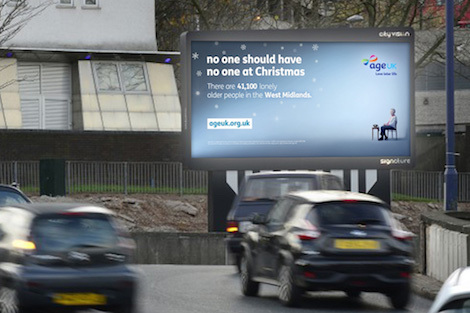 This week, Age UK is launching a DOOH campaign to raise awareness about the plight of loneliness amongst older people over the festive period and, indeed, at other times of the year too. The activity will see the charity take its ‘No one should have no one at Christmas’ message nationwide in a geotargeted and contextually relevant campaign spanning roadside digital billboards until the 4th December, 2016. The DOOH campaign draws on the charity’s ground-breaking ‘loneliness heat maps’ which show the risk of loneliness among older people in every neighbourhood in England. Grand Visual produced the campaign from repurposed poster artwork and each execution referenced locally relevant figures with subtle motion techniques added for those sites that permit it, like Signature’s CityVision, Holloway Head billboard in Birmingham, which announced ‘There are 41,000 lonely older people in the West Midlands’ alongside the strapline ‘No one should have no-one’ and call to action to visit www.ageuk.org.uk. 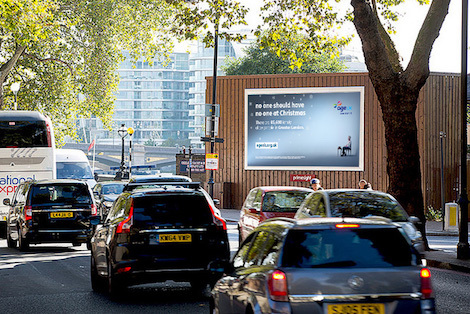 The nationwide DOOH campaign was planned and booked by Talon and runs across Primesight, Signature and Clear Channel roadside D48 networks. The DOOH activity supports a larger outdoor push and is part of a fully integrated campaign spanning direct response and social media. The campaign aims to drive donations, encourage people to volunteer and take action locally, and raise public awareness of the issue more broadly. This entry was posted on Monday, November 21st, 2016 at 14:29 @645 and is filed under DailyDOOH Update. You can follow any responses to this entry through the RSS 2.0 feed. You can leave a response, or trackback from your own site.